Another Perini Navi joins the fleet of sailing superyachts on the market as Dirk Johnson at Merle Wood tells me that he's signed a joint central agency, with Bruce Brakenhoff Jr of Perini Navi USA, for the sale of Perini Navi's 46m Antara. Launched in 1991, the superyacht went back to the Viareggio yard in 2006/2007 for an extensive $7 million refit and now has an extended flybridge with large Jacuzzi and sun cushions, new teak decks, new sails and a new swim platform and also has high-speed broadband internet access throughout the boat. Dirk says that she's currently on her way to the Caribbean for the winter charter season, sleeping eight guests in a master, VIP and two twins. 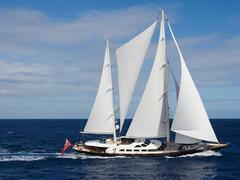 Her asking price has been set at $20.95 million.